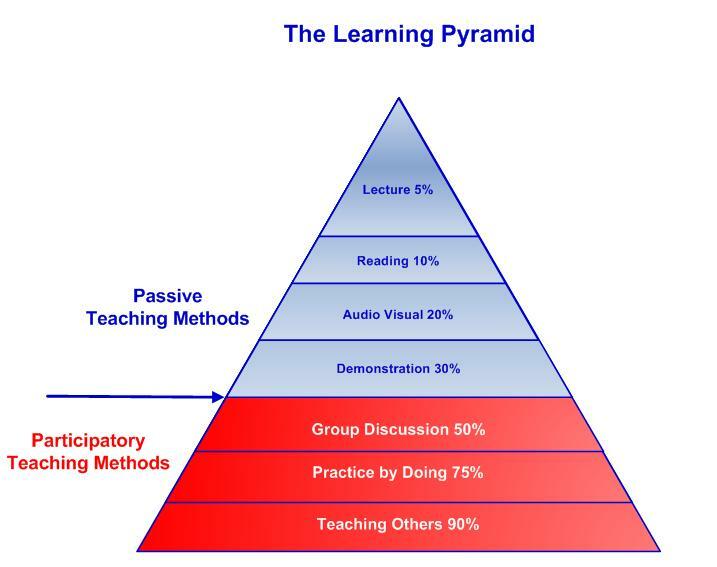 the learning pyramid - various percentages of retention. There are various methods a learner can engage in which will allow them to learn information at various percentages of retention. The Learning Pyramid, researched and created by the National training Laboratories in Betel, Maine, illustrates the percentage of learner recall that is associated with various approaches. The first four levels (lecture, reading, audio visual and demonstration) are passive learning methods. In contrast, the bottom three levels (discussion group, practice by doing and teach others are participatory (active) learning methods. The Learning Pyramid clearly illustrates that active participation in the learning process results in a higher retention of learning. Based on the research, the least effective method would be a lecture. Long term retention rates of a typical lecture, where an individual merely stands in front of people and talks is considered to be around 5%. However, if people get actively involved and collaborate with others his or her retention rate dramatically increases. The difference in retention between passive and active (participatory) methods may be due to the extent of reflection and deep cognitive processing. The Learning Pyramid demonstrates that the best methods for learning retention are at the Base of the Pyramid. Therefore, it is best to design lessons and activities with this information in mind to ensure the learners are actively engaged in the learning process. This is achieved through discussion groups, practice activities, collaboration and teaching others.